Unlike other static or lazy stop-loss tools, the Dynamic Trailing Stop (DTS) uses our proprietary “Smart-Stop” technology to protect your profits while minimizing risk. While there are many stop-loss indicators, the DTS consistently outperforms other methods with superior accuracy and flexibility. The Dynamic Trailing Stop MTF Indicators lets you track the DTS across 5 different timeframes, interval periods, and instruments – all from just one chart! Each row of dots corresponds to a different DataStream, and are color-coded based on DTS and trend conditions. Many of the most successful traders rely on monitoring several timeframes at once, from the weekly down to the 1 minute. They do this because using only one timeframe causes most traders to become lost in the "noise" of random price movements — resulting in losing trades and overthinking every decision. 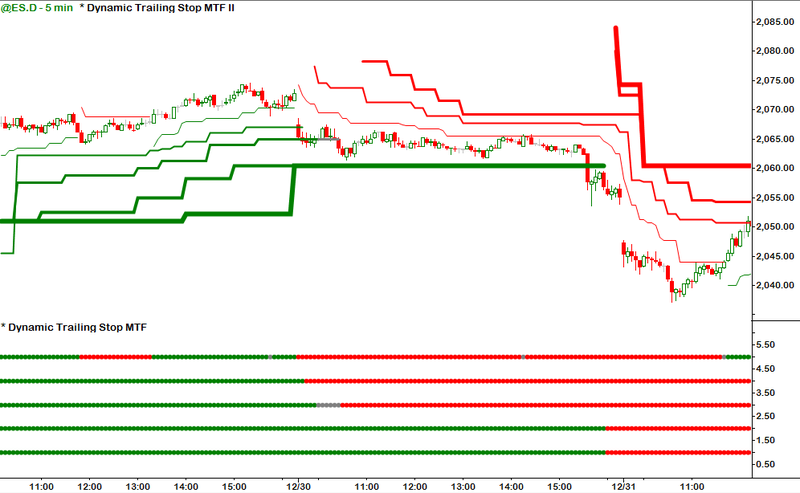 For instance, the trend on a 30 minute chart may be much different than the trend on a 5 minute or 120 minute chart. By tracking multiple timeframes at once, you'll gain a clearer perspective of the trend and will always know when multiple timeframes are in harmony or disagreement. That said, the Dynamic Trailing Stop MTF Indicators are capable of much more than just "Multiple Time Frame" functionality. They allow for new methods of trading and chart analysis that have never been possible until now! 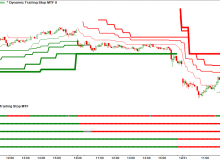 Choose both the timeframe and instrument for each DataStream — unlocking new methods of trading and chart analysis. While some traders are familiar with MTF Indicators, only our versions can be used as Multi-Interval and Multi-Instrument Indicators! The DTS MTF Indicators display the color-coded trend at all times so you know if the trend is bullish or bearish on each DataStream. 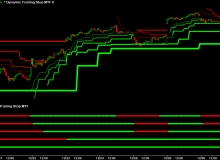 Each MTF Indicator is designed to plot as 5 rows of dots with each row corresponding to a specific DataStream. The row on the top is the smallest timeframe (DataStream #1) and the row on the bottom is the largest timeframe (DataStream #5). Most traders waste too much time switching back and forth between charts to check different timeframes and instruments. The DTS MTF Indicators will save you from the constant clicking — making your trading routine more organized and less stressful. Using multiple charts with the same Indicators is a drain on your PC's resources. 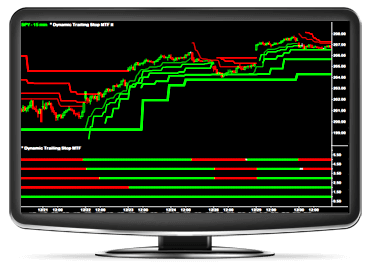 The DTS MTF Indicators reduce the strain on your PC — providing a speed boost over other methods of MTF chart analysis. 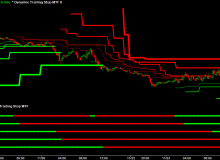 We take color-coding to a new level by giving you full control of color settings for all signals and trend conditions. Each trader has unique color preferences (and those with color blindness struggle with the common greens and reds), so we enable you to customize everything to your specific needs. The “Dynamic Trailing Stop MTF Panel” displays the trend conditions of the Dynamic Trailing Stop (DTS) for up to 5 different DataStreams (using any timeframe, interval, and symbol). Each DataStream corresponds to a row of dots, and are color-coded based on whether the Dynamic Trailing Stop is bullish or bearish. 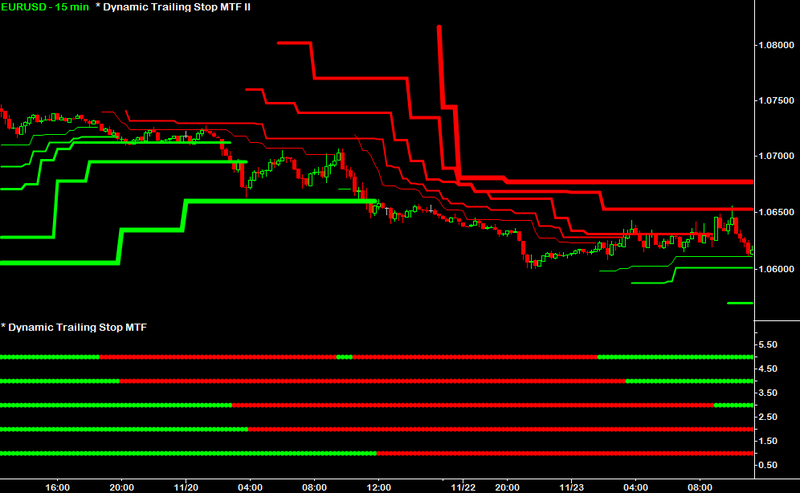 This MTF Indicator is based on the Dynamic Trailing Stop (DTS), which is NOT just another ATR-based stop-loss. It's algorithm fuses together standard deviations of range and recent price movements — enabling the DTS to adapt to intelligently adapt to price movements. When price consolidates or moves sideways, our proprietary “Smart-Stop” technology pinpoints recent support and resistance levels — remaining unchanged until price exits consolidation and resumes moving upwards or downwards. Another benefit is the ability to “Round to the Nearest Tick(s)”, which lets you adapt the DTS to each unique trading instrument and their specific tick sizes (minimum price movements). Because the DTS adapts so intelligently to price movements, it is accurate and effective across all timeframes, chart types, and trading vehicles (stocks, options, ETFs, fixed income, futures, and Forex). 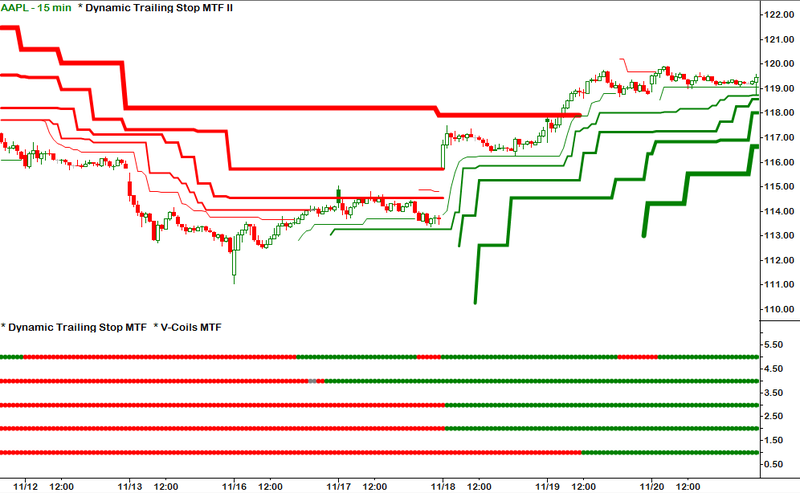 The “Dynamic Trailing Stop MTF Lines” plots a line at the value of the Dynamic Trailing Stop (DTS) for up to 5 different DataStreams (using any timeframe, interval, and symbol). 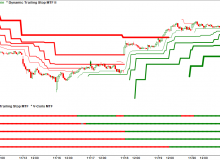 Each DataStream corresponds to a different line, and all lines are color-coded based on whether the Dynamic Trailing Stop is bullish or bearish. 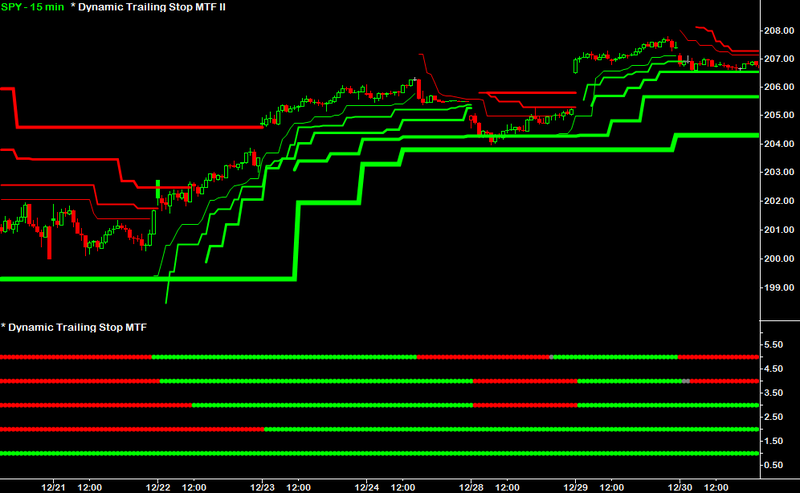 Have a question about the Dynamic Trailing Stop MTF Indicators? Check out the Dynamic Trailing Stop MTF - User Guide to learn more!